Buenos Aires, Argentina - A fraternal environment prevailed among diverse spiritual and community leaders during a lunch at the Jewish Museum of Buenos Aires on Sept. 29, 2014. 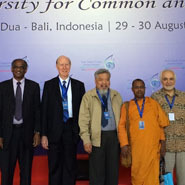 Bali, Indonesia - UPF sponsored a side event on the theme of “Building Trust through Interreligious Dialogue” at the UN Alliance of Civilizations’ Sixth Global Forum in Bali, Indonesia, Aug. 29-30, 2014. Utrecht, Netherlands - UPF-Netherlands held an Ambassadors for Peace meeting on Aug. 28, 2014, in Utrecht focusing on Christianity in China. 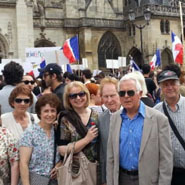 Paris, France - UPF-France supported the initiative of a young student who raised her voice and organized a gathering in Paris on August 3, 2014, to show a peaceful relationship between Jews and Muslims in France. The theme was "Gathering for Peace, Jews and Muslims, Hand in Hand." As the war between Israel and Hamas continued to claim victims, and cause suffer and misery in both Israel and Gaza, two prayer meetings took place to offer interfaith prayers for peace during the day in Daliat El-Carmel and Nazareth on July 30, 2014. Kafr Kanna, Israel - In the midst of the pain of the current war in our region, under the sounds of sirens and missile threats, the Jerusalem Interfaith Forum gathered in Kafr Kanna on July 16, 2014, to offer a common prayer for true peace. Stockholm, Sweden - UPF-Sweden held a forum on "The Role of Religion and Spirituality in Society, Today and Tomorrow" on June 29, 2014, to address the increasing marginalization of religion. 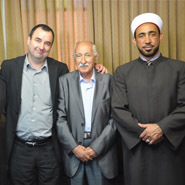 Acre, Israel - The Jerusalem interfaith forum gathered in the beautiful ancient port city of Acre, in which Arabs and Jews live together, on June 16, 2014, for a second forum hosted at El-Jazar Mosque. Auckland, New Zealand - On the stormy evening of June 10, 2014, 70 people gathered for an interfaith program at the Kadampa Buddhist Temple in Papatoetoe featuring three faith leaders as speakers. "Peace is a gift of God, but requires our efforts. Let us be people of peace in prayer and deed," Pope Francis tweeted regarding the June 8 prayer meeting at the Vatican with Jewish, Christian and Muslim leaders.